Does radical enhancement threaten our sense of self? If we extended our lives by 200 years, or if we succeeded in uploading our minds to an artificial substrate, would we undermine our sense of personal identity? If so, would it be wiser to avoid such radical forms of enhancement? These are the questions posed in chapter 4 of Nicholas Agar’s book Truly Human Enhancement. Over the next two posts I’ll take a look at Agar’s answers. This is all part of my ongoing series of reflections on Agar’s book. (1) Condition X is a necessary condition for personal identity to obtain. (2) Y undermines or cancels condition X. (3) Therefore, Y necessarily undermines personal identity. Such arguments are part of the game played by philosophers to identify the necessary and sufficient conditions for the realisation or exemplification of certain properties and concepts. Agar does not wish to play this game. He is clear that he is not arguing that radical enhancement will necessarily undermine personal identity. He is arguing that it could, and that we would be wise to avoid that risk. This is really Agar preferred mode of argumentation, as mentioned in the previous post. To get a handle on Agar’s argument, we will need to do three things. First, we’ll need a (very) brief primer on the concept of personal identity and the sense in which that concept is invoked in Agar’s argument. Second, we’ll need to look at Agar’s argument that radical enhancement threatens autobiographical memory. And then third, we’ll need to consider how Agar’s argument can be interpreted in terms of a game we play with our future selves. 1. What is personal identity and why does it matter? The Metaphysical Sense: Identity is what makes me the same person as I was ten minutes ago. Identity is a one-to-one relationship. So X and Y are identical, if and only if, they are one and the same thing (hence, why this is sometimes referred to as numerical identity). The Evaluative Sense: Identity is what makes my continued existence meaningful, valuable or worthwhile. When asking questions about identity I am interested in what conditions or mishaps might make continued existence worthless or devoid of meaning. Identity, under this definition, is what matters to us in our survival (and, as Parfit famously argued, this need not require a one-to-one relationship). There are many interesting philosophical questions about identity. And we could go back and forth forever on which sense of identity is the important one. Those are debates worth having. But we don’t need to have them here. Agar’s argument against radical enhancement works with either sense in mind. In addition to the different senses of the word, there are also different accounts of what constitutes our identity (in either sense). The two leading ones are the psychological continuity account and the animalist account. According to the psychological continuity account, our identities are constituted by a set of temporally overlapping mental states. In other words, the reason why I am the same person I was ten minutes ago (or the reason why myself ten minutes should care about who I am now) is because we share certain mental states: we have the same beliefs, desires, memories etc.). According to the animalist account, our identities are constituted by a continuity relationship between the biological organism that we are now and that we will be later. (This is often thought to allow for identity to be preserved in troubling cases like that of the person in a PVS). Agar works with the psychological continuity account in his argument. This seems appropriate to me since that seems like the most plausible theory of identity (particularly in the evaluative sense). Still, one might wonder whether his argument would work as well against the animalist account. I think it probably would. Indeed, depending on the nature of the radical enhancement, it might be easier to argue that identity is undermined on the animalist account. For example, if radical enhancement involves the destruction of the biological human form, and the uploading of the mind to a digital medium, then I think it is safe to say that biological continuity has been undermined. So much for the conceptual framework. Now we must deal with Agar’s actual argument: how exactly would radical enhancement undermine or threaten our identities? To answer that, Agar appeals to the notion of autobiographical memory. This is the memory of personal events and details from our lives. It is like the narrative tale we tell ourselves about who we are, what has happened and why is it important. According to modern theories of memory, remembering is a reconstructive process. My brain does not record my past life experiences like a video-recorder. Instead, it creates schemata which encode salient information. The act of remembering then fills out these schemata. But in order to fill them out, other cognitive resources must be drawn upon. For example, my ability to remember riding a bike this morning might rely my having the requisite learned skill and background knowledge. It might also rely on my evaluative beliefs and desires at the present moment (e.g. my ongoing interest in good health, better bike riding etc.). Disease can affect the reconstructive processes of autobiographical memory. Alzheimer’s is the example discussed by Agar. He refers, in particular, to the case of Ronald Reagan. It was said that, in his final years, Reagan forgot that he had been President of the US, a devastating loss of autobiographical memory. Agar speculates that this probably wasn’t because all the schemata for his presidential life were destroyed, but rather because he lost a lot of the background knowledge that would be needed to reconstruct those memories. How does this relate to radical enhancement? Well, Agar wants to argue that radical enhancement could have a disruptive effect on the reconstructive process. If we radically enhance ourselves (either through biological or technological manipulation), our future radically enhanced selves are unlikely to actually forget about us. Indeed, modern recording technologies will probably make that impossible: the past will always be recoverable if they wish it to be. The problem, instead, is that our future radically enhanced selves are likely to have very different evaluative frameworks. Things that seemed important or significant to us, will seem trivial and inconsequential to them. My 120km bike ride this morning — a significant and meaningful achievement to me right now — will look like a walk in park to my radically enhanced future self. He (or she or it) won’t deem it important enough to remember. We experience this to some extent ourselves right now: think about how you rarely have a good memory for the mundane details in your life. Agar illustrates the problem by discussing a fictional example. The example comes from the late Iain M. Banks’s novel Matter. The novel was part of his Culture series, which frequently engaged with themes of radical enhancement. In the novel, a character named Anaplian — who comes from a world with sixteenth century technology and culture — undergoes a series of radical enhancements. She is made significantly stronger or faster; she can sense radio waves; she can operate machinery through thought alone; and she can switch pain and fatigue on and off at will. After she undergoes all this, she develops a very ambivalent relationship to her past self. She cares less and less about who she was. (4) Our autobiographical memories are integral to our identities (metaphysical/evaluative): they are like a record of important events and experiences in our lives. (5) Autobiographical remembering relies on an array of background cognitive resources to reconstruct the memories. (6) Radical enhancement will so alter those background cognitive resources that we may no longer be able (or, rather, willing) to reconstruct those memories. (7) Therefore, radical enhancement will undermine our identities. I won’t say too much about the merits of this argument for now (I leave that until the next post), but here is a way to think about it that might be helpful. Game theorists often look at the decision to start smoking as a game you play with your future self. When given the opportunity to reflect, broadly, on the shape of their lives, many people would prefer not to smoke, despite the short-term rewards they experience. This is because they prioritise and prefer their long term health and well-being over their short-term desire to smoke. The problem is that we aren’t very good at prioritising long-term goals over short-term desires. We often undergo a process known as preference reversal: a point where the short term desire to smoke rises about the long-term desire for health and well-being. Because of this phenomenon of preference reversal, it pays to think about the decision to start smoking as being akin to a game you play with your future self. This is depicted in the game tree below. 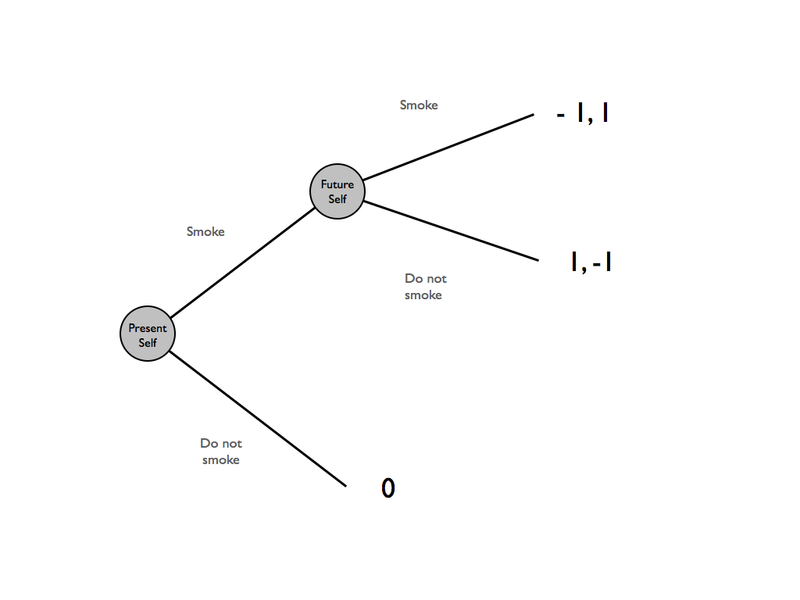 Your present self gets a payoff of 0 for not smoking in the short-term, and a small reward from smoking in the short-term (say 1, but it doesn’t really matter for this game). In the long-term, your present self gets a payoff of 1 for not smoking, and a payoff of −1 for smoking (due to the health effects). Your future self, on the other hand, gets a payoff of 1 for smoking and −1 for not smoking (he, after all, is addicted and suffers the loss much more). When you look at the decision to start smoking like this, you realise that your future self is not on your side. He is a competitor in this game. If you care about your long-term health, you need to do something to make sure he doesn’t get a chance to act out his preferences. You can do this either by not smoking at all in the short-term (and thereby never developing the addiction) or you can develop some commitment strategy that will limit the options open to your future self (think Ulysses and the Sirens). The relevance of this here is that Agar’s argument about radical enhancement and person identity involves a similar game. Agar is saying that your present self has certain life interests and experiences that are important to it right now. It would like to see those interests and experiences preserved in the long-term. But your present self can’t rely on your radically enhanced future self caring about those things. It may have very difference preferences. Agar emphasises this by noting the asymmetrical attitude we have towards our past and future. Since we tend to care more about our future than our past, we can at least count on our radically enhanced future self having a similar bias. This increases the likelihood of him/her disconnecting from our present selves. Okay, so I’ll leave it there for now. In the second part, I’ll look at Agar’s childhood-adulthood analogy (which he uses to further underscore his point about radical enhancement and identity), and consider some weaknesses in this argument. My present self wants to transcend itself. Hmm.. pleaze lie on zee couch..
Q: At what age did zis compulsion begin, what first brought this contemplation to mind? I want to transcend myself too, but not to the point that my future self/ves cease(s) to be recognisably me. So this is an issue I find interesting, though personally, judging from this brief summary, I don’t think I’m likely to find Agar’s thoughts on the subject that enlightening. A better approach, in my view, might be to consider what it is that makes us care about our future selves. (Obviously we all do, albeit to varying extents.) To some extent our tendency to do so seems to be hardwired, and is obviously related to our survival instinct. The reality of psychological continuity clearly plays an essential role in bolstering this, which is one reason we find Alzheimer’s, strokes and the like so disturbing both as future possibilities for ourselves and when they happen to people we know. As a more direct comment on Agar’s argument, I agree that the evolution of our evualative frameworks is relevant, however this is hardly something that doesn’t already happen, without radical enhancement. Our evaluative framework already evolves over the course of our lives, and that doesn’t seem to significantly undermine our willingness to care about our future selves. In any case, at the risk of come across as somewhat disrespectful, I don’t need philosophers to tell me what I should care about. (This is a response to statements like “Agar’s main contention is that radical enhancement could indeed pose a serious threat to our personal identity and that this is something we should care about.”) WhatI think they can do is to help me sort out the conceptual complexities involved in deciding that for myself. Of course, this is related to my moral subjectivist metaethical standpoint. I don’t think I’ve quite grasped the significance of the game theory point. How can my future self/ves be on my side or working against me, since he/she/it/they do not yet exist? As the author says, people tend not to be very good at putting long-term interests above short-term desires, even when the former are clear and one really does care about them. It is our present urges that are working against us, not our future selves. Interestingly, I don’t think I actually care that much about the extent to which my future self/ves will care about my present self, and this is essentially for the same reason: my future self/ves has no influence on my present self (unless causaility is much weirder than we generally assume and really can work backwards in time). Overall, I think what mainly drives people’s interest in these issues, and in so many other issues, is the essential conflict between our desire to improve things and our desire to keep things as they are. If we didn’t have the latter desire, I think we would essentially all be utilitarians, even if we had varying views on what it really means to maximise well-being. I think what makes so many people dislike utilitarianism (which is something I’ve been trying to understand) is that it seems to potentially require us to do things that bring about rather abrupt change. And in general we don’t like abrupt change. I think this is the essential reason why I’m inclined to be cautious about radical enhancement. The change seems too abrupt. I’ll at least want it to happen relatively gradually. And, of course, let others do it first, and see what stories they tell about the experience. Anyone who has grown from a child, or even let go of a religion, should know the danger of allowing a past self to determine a future self by limiting it’s ability to think. I have done both, but I don’t particularly resent my past selves for limiting my ability to think. In fact I’m not sure they did limit my ability to think, they rather influenced what I was thinking about. Certainly there have been times in the past when I felt I wasted years of my life worrying about God and the afterlife, but now I see things somewhat differently. Basically this was what made sense to me at the time, and although for the moment I no longer see this as a useful thing to do, I don’t mind the fact that I did in the past. To be clear, I am not against radical enhancement, nor do I feel particularly threatened by it. I’m just inclined to be cautious. One thing I have learnt from growing from a child, and from letting go of my religion, is that change in any case happens, so to avoid frustration and despair it is better to embrace it, cautiously. Speculation on the “possibilities” of future change, (of Self), seems illogical and rather moot? “Clinging” to the past, and “grasping” for a future beyond practicable reach is what the Buddha defines as the root cause of suffering - impermanence, (anicca), is indisputable? Yet the more interesting question is what motivates a desire to transcend the physical body? Gnostic tendencies or merely concerns for mortality/longevity? Are there any Transhumans who do NOT wish to transcend physical form?